Mind you, for this to work well, you need a rack boss. I suppose you could find some kind of clamp to do the same job, though...? Why stop there - what about the seat post? Moar filthy hub pr0n here. 1) Back off both axle cones by several turns. 2) Screw the RH cone in finger tight then back it off no more than half a turn. Hold the axle (adjustable spanner on the flats - grip it between your knees) and cone so they cannot move, and lock it there with the locknut. Sadly SA don't use the brilliant tab washer any more, which made RH cone adjustment a breeze. 3) Only now can you adjust the LH cone. You should aim for infinitesmal play at the rim. Some SA hubs can be adjusted with zero play if they're unusually good examples. Mine was too loose after the first ride; I don't think they pay much attention to it at the factory, but if the cone adjustment is incorrect, the false neutrals can be wider than they should be. So you had a good long think about it then. 135 miles or so, and 2nd gear is pretty much run-in and not very noisy at all. 1st gear is still like a coffee grinder, although the pedals spin for about 12 revs with the wheel off the ground. Evidence of a lack of efficiency - the hub is slightly warm (compared to the front one) after a ride. Must be 10W or so being dissipated in there. I'll take it up to 200 miles, strip, clean and re-grease. A few weeks back, I rode with Philippa Wheeler, who'd fitted one to one of her road/path bikes. She reckoned it was very similar to the ASC in regards to backlash and she has covered a lot of miles on the ASC. I met my first fellow on the road S3X rider this morning in Streatham. He had a grey Kogswell and is called Adam. The bike had metal mudguards one of which rattled enough to make the whole thing sound like a threshing machine. As long as you have a normal-sized steel top tube, just get a SA fulcrum clip (not forgetting the insert) and SA roller. That's how it was done in t'old days. Thanks to the fabulous and splendid offices of one Mr Zachariah* Zoidberg Esq., I am now in possession of a selection of band-on DT bosses, one of which is bound** to offer me the attachment point I need for mounting the shifter. *Bet you didn't know that was his real name, did you? **Ba-doom, tish! D'ya see what I did there? I have my S3X in bits. Photos when I've cleaned it up, before I regrease and reassemble it. There are very few parts, and no-one should be scared to strip one. To do this without damage you need a selection of cone spanners, some small circlip pliers and the Sturmey-Archer ball ring spanner. One nice thing about a reversible drive is that the mechanism doesn't screw itself so hard into the shell that you need a scaffold pole to unscrew it. Does this mean that, unlike a "normal" hub, the the cones each side are independent of each other? No, they're not, but only the RH cone determines how tight the internals are; it's compressing them against something immovable (generally a stop on the axle). There has to be clearance between the internals for them to rotate freely at different speeds, and to allow lubricant to penetrate. The Sturmey-Archer grease for the internals is interesting stuff - it's a dark brown grease and oil mix, and can actually flow (slowly). The SRAM IGH grease is very stiff, like toothpaste. This is the axle key. The LH dog is quite shiny already, although it doesn't really show up in the photo. This is the slot in which it slides - notice the wear. Cool. Although I doubt I'll be doing it to mine. Do you ever put them back together and wonder why you have a bit left over? "And this is the piling swivel, Which in your case you have not got." I ran a quiz at the Tandem Club rally. 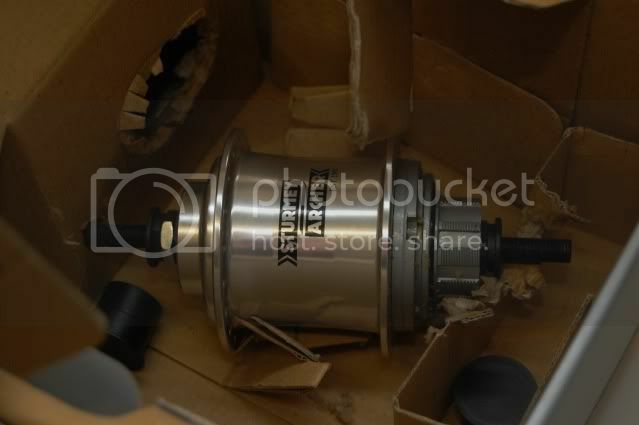 For the "table top" bit, every team was presented with an exploded view of a Sram 3 x 7 hub and list of parts in alphabetical order. They just had to match the part to the position on the diagram. I find SRAMs more confusing. They like their circlips, do the Germans. Update: it's much quieter after its service, probably because it has more of the brown runny grease inside. Not as much of a rattle in top, and less coffee grinder noise in 1st. Couldn't make it slip up the steepest hill in the village, and it shifts much more easily; it used to stick a bit going into top. Whether this will persist as the grease gets displaced from the axle slot, I'll have to wait and see. So for those of us not willing to strip the whole thing down (I'm too scared of pingfuckits) do we just schlosh a load of new jollop in there?